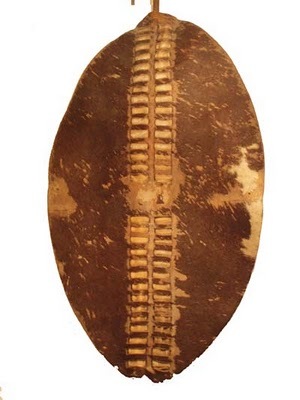 The Ngoni inherited a very strong military tradition from their origins as a migrating army. In the words of their historian YM.Cibambo, ‘To the Ngoni war was like work and his heart rejoiced to think of it.' At least some groups seem to have retained the Zulu system of organizing their warriors into regiments based on age, although most units were based on territorial divisions, and warriors tended to live in their villages rather than in separate kraals as they did in the Zulu army. In Nyasaland, young men were often formed en masse into a new regiment known as a libandla, of which each large village or prominent chief might have several. Each libandla was divided into companies called libuto, which varied in strength up to 100 men or more, and would be allocated to one of the two maior divisions of the army - the younger men, or amajaha and the veteran amadoda. Each regiment and company was led by an officer known as an induna, who was responsible to the overall leader or 'war induna', appointed by the nkosi or chief. 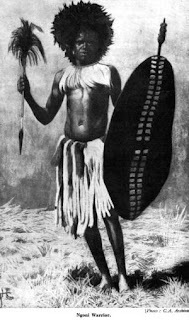 An independent army of any size continued to be known by the Zulu term impi. There is little reliable information on the size of Ngoni armies, although it seems that at least in the fertile country around Lake Nyasa exceptionally large forces could be raised. The British Central Africa Gazette of December 1894 was no doubt exaggerating when it claimed that the central Ngoni could put 50,000 men into the field, but in 1878 W.A.Elmslie reported seeing a 10,000-strong army of northem Ngoni. 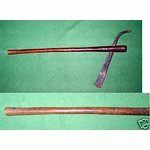 It is generally agreed that the secret of the dramatic success of the Ngoni in East Africa was their introduction of close combat tactics, using the short Zulu iklwa or stabbing assegai, into a region where warriors had traditionally thrown their spears from a distance. Perhaps more important, however, was the moral ascendancy which they achieved over most of their opponents, with what Lugard described as their ‘character for invincible courage’. Nevertheless, by the second half of the 19th century most accounts suggest that Ngoni war parties were actually fairly cautious, and preferred arnbushes and night attacks to open battle. The Tuta were very wary of firearms; Burton says that they would ‘decamp without delay’ if they encountered a caravan headed by a red Zanzibari flag, knowing that it would be accompanied by askaris with muskets. It is probably this fear of guns which accounts for the fact that Speke and Stanley both traversed the Tuta country at the height of theirdepredations without having to fight. According to Cibambo, an army would march out to war very slowly, sending out scouts in all directions. Boys and girls from the warriors’ households accompanied them to carry food and water; and sections of men were detailed to protect them from attack. 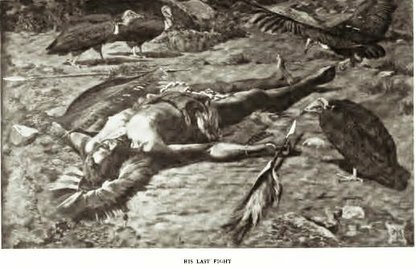 When they neared an enemy village the men would sit and rest while their indunas reconnoitred carefully, meanwhile taking snuff or smoking hemp, which ‘maddened the warriors and gave them hearts without fear’. Eventually their commander called them to arms by performing his own praise-dance, and the companies deployed into their 'horn' formation, blowing homs and whistling to drown the sound of the enemy's drums. At last the command was given - ‘Let the bulls fight’ Then every warrior would race to be the first over the stockade, because to do so earned not only great prestige but the first choice of the captured livestock. After the fight each induna would report to the commander the names of those who had been at the front, as well as those of any other men who had especially distinguished themselves. These men were singled out for praise at the victory dance held before the nkosi on their return. From the reports of European observers, however, it seems that surprise attacks under cover of darkness were at least as common as set-piece assaults. Under these circumstances the victims were usually too terror-struck to offer any resistance. Lugard quotes a report of a raid on Lake Nyasa in 1893, in which ‘the Angoni came down to the lake shore in great numbers, and attacked the village of Kayuni. They entered the village silently, and each warrior took up his position at the door of a hut, and ordered the inmates to come forth. Every man and boy was speared as he emerged, and every woman was captured’ Many of the tribes living along the shore were forced to build their huts on stilts out in the lake for fear of such raids. Pitched battles in the open were rarer, but the German trader Carl Wiese describes one encounter which took place in northem Mozambique in the late 1880s, between an Ngoni raiding party and a 400-strong Arab caravan. The Ngoni divided themselves into three divisions: first, the newly formed Kabaenda regiment, which was made up of youths between 14 and 18 years old; then the Mahora and Mabema regiments, comprising men in their twenties; and finally the Amadoda or veterans. The Kabaenda opened the battle by charging the Arabs, but fled when the latter fired a volley from their muzzle-loading muskets. Wiese does not say so, but it is likely that this retreat was part of the Ngoni plan. The Arabs pursued the youngsters recklessly, not even stopping to reload, and were ambushed by the Mahora and Mabema who were lying in wait.The Kabaenda then retumed to the attack, and the Arabs were sorrounded. The Amadoda had been stationed in ambush along the road in the opposite direction in arse the enemy resumed their march after driving off the attack. but now hurried up and joined in the slaughter: Most of the Ngoni casualties occured among the youngsters of the Kabaenda.Very few Arabs survived the battle, and those of their leaders who escaped later committed suicide in disgrace. Below is a depiction of Shaka Zulu first war. The Ngoni war techniques were similar to the Zulus'. The Ngoni of Tanganyika came under German control during the 1890s. There was some fierce fighting in the south in 1897 before they submitted to an expedition under Captains Engelhardt and Fulebom. The stronghold of Songea only fell after a number of Ngoni chiefs were lured out under a flag of truce and arrested. It was not until the Maji Maji Rebellion of 1905 that the tribe made a serious attempt to avenge this treachery. The Lake Nyasa kingdoms came within what became known as British Central Africa, and were brought under British rule during the 1890s. The northern kingdom was friendly to the British, mainly thanks to the influence of the Commissioner, Dr laws. They welcomed missionaries and voluntarily gave up raiding. In the central kingdom, a chief named Chikusi accepted British protection in 1890, but during the reign of his successor Gomani a group of anti-British headmen gained influence. In 1896 they attacked a mission station, and in response a punitive expedition defeated an Ngoni impi and sacked Gomani's village. 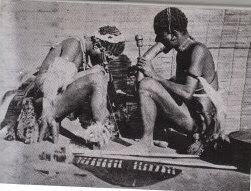 The central Ngoni lost most of their cattle and submitted to the British administration. Further west, on the plateau between the lake and the Luangwa River in what is now north-eastern Zambia, the smaller kingdom ruled by Mpezeni was brought under the control of the British South Africa Company in 1898, and the last free Ngoni lost their independence.